Workers’ compensation was originally designed to facilitate medical care for workers who suffered injuries at their place of employment. Over time, the benefits grew to include temporary and permanent disability benefits, supplemental job displacement training (vocational rehab), and death benefits paid to spouses, children, or next of kin. One of the primary duties of the safety, security, and emergency management industry is to hold businesses to a standard of safety to reduce workplace injuries as much as possible. Better safety precautions, more secure working environments, and the use of proper equipment during emergency situations can reduce the number of claims, protect workers, and result in lower insurance rates. Additionally, safety, security, and emergency management businesses need to have a workers’ compensation program (generally required by law, by state) in place for their own employees, who may be injured in the course of their duties inspecting client business facilities and safety practices. Students who are attending an online emergency management degree program and aiming for a career in the safety and security industry should be up to date on the latest workers’ compensation practices and details. Employees can file workers’ compensation claims for several different reasons ranging from a single event to repeated exposure to harmful duties over time. A factory worker might file a claim after a heavy item crushes his foot or leg. A court reported might also file a claim after years of stenography cause her to develop carpal tunnel syndrome. For emergency management workers, claims may be filed for anything from back injuries caused by repeated lifting to depression or anxiety disorders caused by a high-stress environment. Safety precautions and education programs instituted by an employer can help reduce the number of injuries that take place, but no system is perfect and injuries can happen even in the safest of environments. If an employee files a claim, the employer must cooperate fully with its workers’ compensation insurance carrier. In most cases, the insuring agency will investigate the claim. Attorneys will likely request employee records, payroll history, employee files, and may interview other employees as well. After the investigation, employers are also required to welcome injured workers back if the injury heals. Penalizing or terminating an employee for filing a workers’ compensation claim can result in heavy civil and criminal charges. In addition to the workers’ compensation laws, which differ slightly from state to state, the Occupational Safety and Health Administration (OSHA) regulates workplace safety and injuries on a federal level. According to marketing strategist Haley Bass’s Concentra.com blog post, “5 Things Small Businesses Need to Know About Workers’ Comp,” businesses are required to not only provide workers’ compensation to their employees, they must also give their employees access to medical and exposure records, personal protective equipment, hazard communication, access to file complaints, and notices about workplace health and safety. Those who work in the safety, security, and emergency management industry are responsible for ensuring that both OSHA standards and individual state workers’ compensation regulations are maintained in all businesses under their purview. 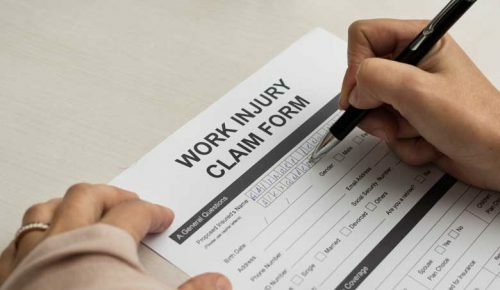 After the workers’ compensation claim is filed and approved, employers should continue to take an active role in their injured employee’s recovery by instituting a return-to-work program. As in most scenarios involving two or more parties, communication is key. Johnson also suggests that employers become directly involved in helping their workers through their injury and recovery periods so they can eventually return to work. The employer’s active involvement can help shorten workers’ compensation temporary disability periods. Another way that employers can take a more active role is to use data analytics solutions to understand where improvements can be made. Data collected in the claims process can be used to derive valuable insights into workers’ compensation causes and outcomes, according to analytics writer Jim Harris in his Risk Management Magazine article, “Improving Workers’ Comp Through Data.” The results of data analysis can help detect spiraling claims (those that involve complex care coordination for multiple injuries), assess case severity, and create scorecards for program performance. A relatively new phenomenon in some states (like California, for instance) makes it possible for emergency volunteers to be covered by worker’s compensation even when they are not officially employed by the organization for which they’re volunteering, according to “Workers’ Compensation and Disability Benefits for Emergency Volunteers” on the Association of State and Territorial Health Officials’ website. The reason some states are expanding workers’ compensation to include emergency volunteers is because volunteers are subjecting themselves to potentially harmful situations, and if they are injured or exposed to illnesses, there should be a way for them to access the benefits traditionally covered by workers’ compensation. “Occasionally workers’ compensation protection will be available because the state’s workers’ compensation statute specifically includes emergency volunteers in its definition of [an employee],” attorney Todd Jasper writes on his firm’s blog about the FEMA CERT Liability Guide. Emergency management responsibilities include understanding how workers’ compensation laws and regulations affect not just emergency services businesses, but also clients’ businesses and even emergency volunteers. Injuries can happen at any workplace, no matter how safe the location seems. But when injuries do occur, workers should receive medical treatment and their employer’s assurance that their jobs will be waiting for them when they recover. Eastern Kentucky University’s online emergency management degree program is designed to show students how to navigate the complex emergency services field. Significant topics include how to implement emergency measures and programs and how to safeguard employee safety and rights. Industry-experienced safety professionals guide students through environmental health and safety classes online, covering both the practical and legal aspects of the emergency management industry. For more information, contact EKU today. Workers Compensation and the Most Dangerous Industries in the U.S.